A dream team works miracles, there is synergy. The members are more successful as a team than when they work separately. In bad teams the opposite is true, as a team they are less successful. A good example of a dream team is the human body, trillions of cells work closely together to work a miracle, a human being. Without this teamwork, we would still be swimming as microbes in the sea. In order to be truly successful, an organization needs to be a great team, or consists of great teams. Building a great team starts with a shared sense of inspirational direction. The moment people are inspired by a common vision of the future, they don’t have to be instructed or motivated. They are self-motivated to work towards the common goal with reduced self-interest. The essential leadership task at stake is to create this higher goal and shared sense of inspirational direction. For that to work, the higher goal must truly move, touch and inspire the people (must have “spirit”). When the team becomes inspired, actions of the individual team members are aligned and drawn towards the inspiring goal (as a magnet). This higher goal is often referred to as the Mission (and sometimes Vision) statement. It is the ultimate reason for its existence and activities. Unfortunately, many Mission statements are politically correct statements, SNORING-BORING and non-differentiating (‘Mission Monitor’, Sarah Pellis, University of Applied Sciences INHolland. 2010). Team building by life-Force will help you build truly inspired teams with a common sense of purpose. Contact us for the possibilities of a training in your organization or visit our English website. Your life can suddenly take a turn for the worse. You become ill, you experience a lot of stress at work, you lose your job, your relationship ends, you suffer from burnout or depression…….. Sometimes these crises lead to an existential crisis, at which you question the very foundations of your life: whether your life has any meaning, purpose, or value. Whether work-related or personal, when you are going through difficult times it is important to realize that we may have little control over our circumstances, we do have control over the way we deal with them. Moreover, important life lessons are hidden behind these circumstances, and uncovering them will give you access to whole new areas, talents and opportunities you did not have access to before. Consider an iceberg, only a small part is visible, the rest is hidden below the surface. The iceberg symbolizes your full potential in life and work. The 10 % visible part represents your knowledge and skills; the conscious part of our personality. The large invisible part represents your inner motivations, believes, core qualities and hidden potential; the unconscious part driving 90% of our behavior. 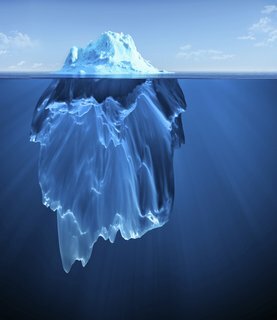 Most trainers and coaches focus on knowledge and skills, but is not the top of the iceberg, but the invisible part below the waterline that ultimately determines your success in life and work or.. “sinks the ship”. Personal development and coaching by Life-Force will help you uncover the deeper meaning of your personal situation, explore your hidden potential and help you take steps towards fulfilling it. Contact us for the possibilities for coaching and training in your organization or visit our English website . Coaching by Skype is also possible.